instrument, different materials have different fixtures, and test can be an important factor in smoothly and test the accuracy of height. University; Research Institute; arbitration, technical supervision departments; building ceramics; petrochemical industry. processing module, and print statements, product performance has reached the international advanced level. 02, automatic shutdown: sample destruction, automatic stop moving. company after a long-term development, and now owns independent R & D team and has been at home and abroad expert injection for product development and design. 1, the clutch gear wear: the need for repair or replacement. 2, the skin friction disc washer or spring wear: need to change the skin or spring washer. 3, handle shift: to adjust the control handle, make it fit in with the alveolar. 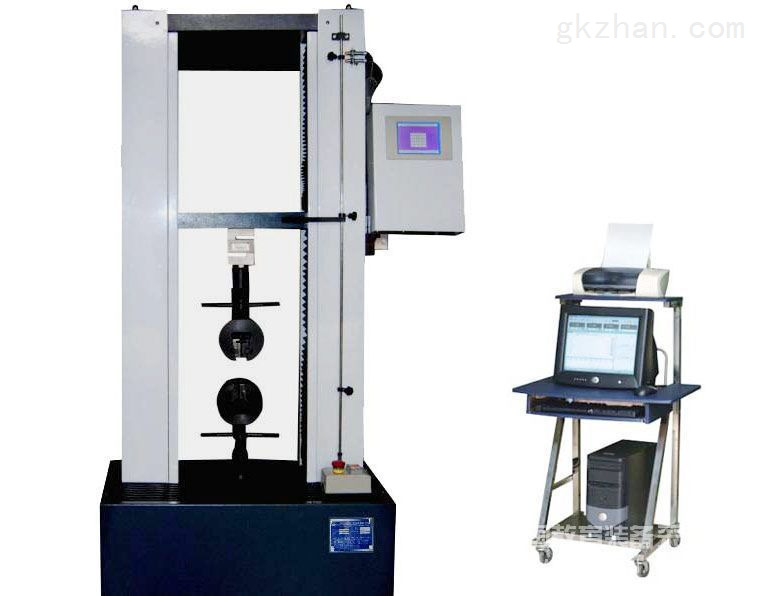 1, tensile testing machine installation is not level: the level to adjust the level of test machine. 2, not only the vertical pendulum hanging weight: A. Adjust the balance weight, so that the vertical. 1, the buffer valve gear position placed improper: adjust the buffer valve to the appropriate location. Vittae 3, buffer valve, or hydraulic oil dirty: washing buffer valve, pipe. Replacement of hydraulic oil. 1, the pointer bearing, spindle bearing corrosion or oil: clean or replace bearing. 2, toothed bar deformation or toothed bar and gear is not engaged: straightening toothed bar or washing, dressing gear, wheel, transmission parts. 3, the buffer valve with cleaning: cleaning buffer valve. 1, the short arm loose: the knife blade tightly. 2, swing weight lighter: give weight weight （both A, B, C weight weight）. eliminate the friction resistance is not normal. components. To eliminate the friction resistance is not normal. 3, the piston rod and the swing rod is connected with the flexible adjustment of both parts not connected parts. The flexible. or driven needle and dial. 2, the driven needle are heavy alligator deviation: adjusting the weights, the balance. errors. Replace the tooth bar, gear. 2, tensile testing machine testing machine installation is not level: level adjustment. 3, toothed bar bending: alignment or replacement tooth bar, adjust the roll gap groove wheel. Nine, computer software on-line prompt box display information overload. calibration information value or other hardware parameters in the. Host ten, the power of the testing machine does not light, not to move up and down. access testing machine is normal; check the socket on the insurance is burned off, remove the spare fuse can be installed. Host eleven, testing machine power supply with power but the equipment can not move up and down. and lower limit is again appropriate position, operating space; check supply voltage access testing machine is normal. 2, according to the use condition and oil machine use period, replace the oil filter and filter periodically, replacing the hydraulic oil. "rewind" file, electromagnetic reversing valve has been in a power-on state, affect the service life of the device. 4, Swap Controller Interface must be shut down the power supply controller. 智能制造网 设计制作，未经允许翻录必究.Copyright(C) https://www.gkzhan.com, All rights reserved.